These five championships continued to be recognized throughout most of the the remainder of the company's existence. The Mid-Atlantic Tag Team titles disappeared in 1985 and the Mid-Atlantic Heavyweight singles title was retired in December of 1986. The NWA World Tag Team titles, the U.S. title, and TV title continued to be recognized in Ted Turner's WCW. And it's worth noting that Crockett's U.S. title is the forerunner of the modern day U.S. title in the WWE, which recognizes its title lineage. At the Mid-Atlantic Gateway, we like to call these guys Crockett's "Grand Slam Champions." In this 4-part series, we'll look at each of these great champions and their own story behind holding all five titles. First up at number one is (appropriately enough) No. 1 Paul Jones. 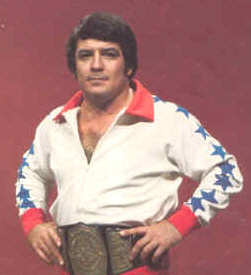 Not only did Paul Jones hold all five of the Crockett championships, he is the only man in history to have done so all in the same calendar year. For Paul, that amazing year was 1975, and as the year began, he held not one, but two of the five titles simultaneously. Paul began 1975 as the Mid-Atlantic TV champion. It was his second reign as TV champion having defeated Ivan Koloff to regain the title a second time on October 30, 1974 at the WRAL TV studios in Raleigh, NC. He would lose the title on February 8, 1975 to a young rising star named Ric Flair, who was a substitute for former champion Ivan Koloff in that match and shocked the wrestling world with his upset victory over Jones. It was Flair's first singles championship, and the second jewel in his own Grand Slam, which we will discuss later. Jones would regain the TV title later in 1975 from Flair before relinquishing the title after a big win of another championship in November. He would hold it a couple more times in 1976 and two years later in 1978. Paul also began the year of 1975 as co-holder of the Mid-Atlantic Tag Team title with partner Tiger Conway, Jr. The two had defeated Rip Hawk and Ric Flair for the honors on December 6, 1974 at County Hall in Charleston, SC. They would go on to lose the titles to Gene and Ole Anderson on February 20, 1975 in Greensboro, NC. Jones would hold these titles again a few years later with partner and protege Ricky Steamboat. Paul briefly held the Mid-Atlantic title in March of 1975 when he upset Johnny Valentine in a fence match in Charlotte on 3/9/75 at the Charlotte Park Center. That title reign is contested by many in history because NWA President Sam Muchnick wound up returning the title to Valentine 10 days later as a result of a controversial finish. However, it was described at the time as Jones being stripped of the title, and not a declaration of his win being null and void. During his 10-day reign he successfully defended the title on a number of occasions. Jones would regain the Mid-Atlantic title seven years later, defeating rival Jack Brisco twice in 1982 for the honors, so even if you were to discount the win over Johnny Valentine (and we don't), he would still be a Grand Slam champion, just the last of the four instead of the first! Paul teamed up with Wahoo McDaniel and defeated the Anderson Brothers on May 15, 1975 in the Greensboro Coliseum. They lost the titles back to the Andersons on June 11, 1975 in the famous "supreme sacrifice" angle we've written about on this site many times over the years. Jones would hold the World Tag Team titles later in the 1970s with partner Ricky Steamboat, and in a memorable heel tag team combination with Baron Von Raschke. He had a final run in the early 80s with his partner the Masked Superstar. The fifth and final jewel in Jones's Grand Slam crown came on Thanksgiving night in 1975, when he defeated Terry Funk for the United States Heavyweight championship in front of a capacity crowd at the Greensboro Coliseum. Funk had just recently that title in a tournament to fill the vacant championship after the plane crash that ended the career of then reigning champion Johnny Valentine. 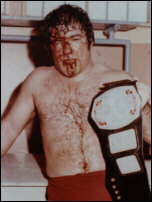 Two weeks after Jones beat Funk for the U.S. title, Funk upset Jack Brisco to win the NWA World title, which set up Jones as his number one challenger in the Mid-Atlantic area. While many younger fans only remember the Paul Jones of the 1980s at the end of his ring career and as a manager throughout most of that decade, we should never forget what a major player he was in our area as one of the world's top wrestlers in the late 1960s and 1970s. He deserves special recognition as the only man to hold Crockett's Grand Slam in the same calendar year. And he was the first man to do it at all. Flair began his run of championships in JCP in 1974 and by 1977 had held them all, becoming the second Grand Slam Champion! Details coming in Part Two. Updated 10/7/18 with an additional detail on Paul Jones tag team title history. Thanks Kyle Rosser. Yearbooks for both 1975 and 1976 now available!